Having been through a life-threatening disease has taught me to appreciate every day and not take any moment for granted. On my job as a hospital nurse I am reminded of this important insight daily and realize how fragile life really is. Even in the happiest of places, such as the maternity ward where I work, seeing mothers and babies being discharged healthy after birth is something one can never take for granted–birth is a true miracle. Miracles we see time after time, day after day. During my third year in the Henrietta Szold Hadassah-Hebrew University School of Nursing, my good friend, Ilana Weismark, living at the time in Israel, was expecting her first child. 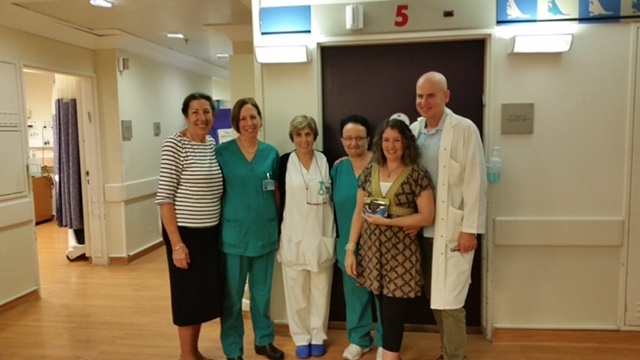 When the time had come, she made her way to the delivery room at Hadassah Hospital Ein Kerem. Full of excitement expecting to hold her newborn in a matter of a few hours, Ilana could not imagine what was about to happen. During her hours of labor, an amniotic fluid embolism–a rare (1 in 30,000 women), life- threatening childbirth emergency–had occurred. A team of gynecologists, midwives, and the emergency resuscitation crew worked tirelessly to save Ilana’s life and by extraordinary efforts to save her womb too. Hours of operating and countless portions of blood are the memories the team will never forget from that day. Ilana’s life was saved the same day baby Kinneret entered the world. All who were there that day felt an extra hand from heaven was helping them. Though Ilana was at this point stable, and out of the operating theater, no one could foresee what implications this trauma would have in the future for this young mother’s life. After four days in the ICU (Intensive Care Unit), Ilana awoke to the news and reality that she was now a mother. Slowly, but surely, Ilana made her way through recovery, regaining her memory, and returning to full activity. It was an incredible one-in-a- million miracle! 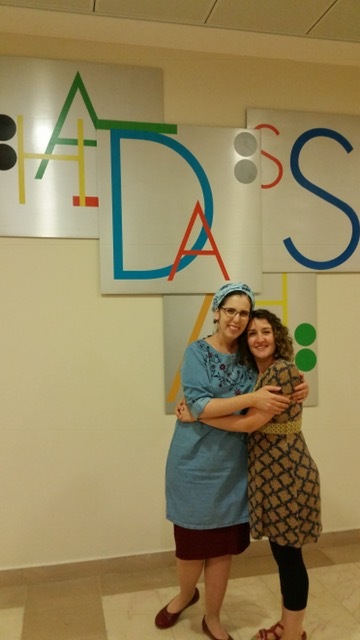 Meeting Ilana again, now the energetic healthy woman that she is, and reliving her story with her was a special experience treasured by all who met her in Hadassah that sunny day. It was a reminder to us of our mission to touch lives and, with the help of G-d, to perform daily miracles; it was yet another reminder that we must give thanks every day and take nothing for granted. Photo above from left to right: Irene Sudri, Naava Braverman, Yael Dror, Jamilla Elquoasmi, Ilana Weismark, Doctor David Mankuta.